Get the benefit of hiring remote workers and save on operational cost. We provide qualified engineers on the required skills to match your needs and work on your project remotely. They will be available offsite and on the need basis. With AResourcepool, you will receive the maximum benefits from this model and we assure you of the quality of work and dedication towards the successful completion of the project. We make sure that the consultants provided to you are from similar backgrounds as yours so that you have an ease of communication. 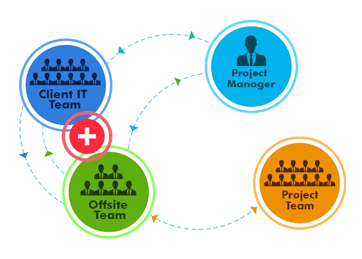 The Offsite Delivery Model is beneficial when the business owners do not have space to accommodate new team members but require them nevertheless due to project needs. Since these remote workers are located nearby, face-to-face meetings are also possible to clarify projects details if required. Also, this model saves operational cost including tools and equipment. The control also remains with the client and he can drive the project the way he likes. This model gives you the advantage of getting your work done at flexible hours from remote workers and manage them accordingly.